Great service , hard worker. A pleasure to deal with. Candace is a very knowledgeable agent, and provides excellent service from the start of the sale to the end of the sale, and even beyond! Candace is a “miracle worker”! She is the most professional and hard-working real-estate agent I have ever met! Candace sold my house in a week and she was able to get multiple offers for us to chose from! Just amazing !! Candace was wonderful! As a first time buyer, she answered all of my questions, researched for me and made the entire process of purchasing easier and less stressful. She took me to see countless houses until I found just the right one. Throughout the experience of looking for a home, she was professional, understanding, knowledgeable and a pleasure to work with. At 46 years old, my first home purchase was deftly managed by Candace Keeling. Two weeks from mortgage pre-approval to offer accepted. From our first conversation, I was at ease with Candace and knew I was in good hands. Candace didn’t balk when I chose 20 of the listings to see in our first outing. Candace got me the house I fell in love with, under budget. I recommend Candace with complete confidence. Candace is a go-getter and will go to any lengths to ensure a client is happy… If you need to see one house, or ten, she will make you and your search a top priority. She’s a busy agent but is available when needed and knows tons of people in London if you need a referral for anything related to home search, she’s referred me to people of all trades to help with moving so it’s not just selling/buying and then goodbye – it’s more like a relationship which I hope will continue for life! Candace recently helped us find a place to rent in Toronto. My husband moved suddenly for work in March while I stayed back in Saskatchewan to pack up our home there. Because he was on his own and often away for business, finding a place in such a competitive market was daunting and difficult. That’s when Candace came to the rescue! Even though she had to drive two hours to get to Toronto, she came in on several occasions and lined up several showings around the city. She patiently helped us through all the lease applications and then the paperwork once our offer was accepted. She listened to exactly what we wanted, gave us great advice, and found us a perfect new home in a wonderful area and, most importantly, in our price range. She worked around difficult schedules and time zone differences all to make sure we were happy. Thank you Candace!! If I could give Candace more than 5 stars I would. She goes above and beyond, and overall I am so thankful we went with Candace. She is extremely knowledgeable, connected, organized, and hard working. You always feel like her top priority, and she is always just a message away from helping with anything you need. I highly, highly recommend going with Candace. Great realtor, very well connected and makes deals happen! highly recommended for first time home buyers and experienced investors. I highly recommend Candace Keeling as a Real Estate Agent. In this fast moving real estate game, you really need to choose an agent who is ambitious, knowledgeable, honest and willing to approach the market with the intent of generating as many quality offers as possible. Candace did not fall short in my expectations! She scheduled three open houses in one week, and I am happy to say our home sold firm, no conditions, well over asking. We are thrilled! Thank you, Candace. Candace was great! She did an amazing job with both our purchase and sale!! She is extremely hardworking! Thanks Candace!! Candace was extremely helpful and super professional through my entire process of helping me put together an offer and purchase my investment property. She not only helped in the purchase of my property but also went out of her way to offer advice, connections, and info on how to best stage, furnish and find tenants which was never expected. Super hard working and a great work ethic. It is clear that she brings with her a ton of knowledge and isn’t just in real estate to make a quick buck like most real estate agents (my personal opinion). Thanks Candace, keep up the great work, will definitely be dealing with you again! We recently purchased a property in London, we have very precise criteria, firm time line and unique circumstances, and were also out of town buyers, Candace worked with us from the start, always going the extra mile to meet our needs and assist us when she could, viewing properties on our behalf and sending us videos along with her opinion of the place. She was always available and easy to reach. I would recommend working with Candace when buying your home. Candace is an amazing Real Estate agent. Her clients are the most important to her. She’s there to make sure You get the best deal and home you’re looking for. Candace is very motivated, innovative and focused. She’s the best at what she does and you will receive more value for your dollar than you could ever imagine. Whether you’re thinking of selling, buying your first house or considering creating a rental/ AirBnb property she’s the best that you could have! 5 stars all around, absolutely blown away by her level of service and responsiveness. 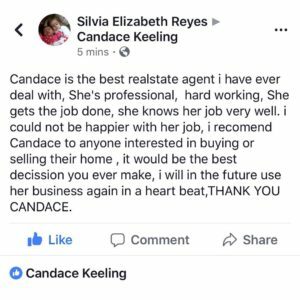 We could not have asked for a better agent 🙂 Thanks Candace ! Candace Keeling is literally the best real estate agent my family has ever dealt with! She’s one of the most hardworking individuals and makes you feel as though you’re her top priority. She sold my parent’s home in a week! I would a million times recommend her to anyone looking to sell their home! Candace was extremely hard working and driven. We live outside the London area and she would go through a house before we even considered it to make sure it was what we were looking for. In fact she would go through the house and FaceTime or video tape it so that we can preview it from three hours away. Now that is a genuine hard working agent. Thanks Candace. Candace helped my purchase my first home last year and she was fantastic. The process was not daunting at all. She closed the deal quickly and smoothly. Candace sold my home in the Byron area this year and what I liked the most was her go-getter attitude. I appreciated being able to get in contact with her at all hours and her personal touches with the sale… she even had baked goods and coffee out for potential buyers at the open house. Thanks for getting me well above market value for my home and the long closing I required! Candace is a great agent and I highly recommend her. She is very knowledgeable and took the time to explain any questions we had before, during, and after selling/buying. We will definately use her for buying/selling our future homes. Candace was an amazing help to my wife and I when we were looking for a place to call home. We came across a home via an online listing and we scheduled a viewing with Candace. Upon completing our viewing the selling agent notified us that an offer was in progress and that if we were interested we should put in our offer sooner rather than later. This is where Candace pulled through for us, she got everything together in record time, and we were able to walk away with a closed deal. Candace made buying my first home so seamless! She spent endless time helping me look and put a lot of hard work into finding me my perfect first home, doing whatever needed to be done! Thank you once again !!! Candace is simply the best!!! She will have your back people! You can totally trust her in caring about your interest whether it’s in finding your forever home or looking into making a profit with gaining rental properties(she knows her stuff!) What super impressed my boyfriend and I was her help in finding us a place to live for the year, even though we were just her airbnb guests for a couple of nights!! She steered us away from putting in an application for an apartment in a bad neighbourhood that we honestly had no clue about! We really thought the area looked good and the apartment felt safe, but then she told us just how dangerous that part of town is. We were so relieved as we were just about to sign a 12 month contract with them. After that she continued to reach out to us even in her very busy schedule and we really felt like she had our back, which was so nice as we just moved to the area and didn’t have anyone to turn too for guidance. She’s just one of those special kinds of people that has a bundle of energy and a big heart.